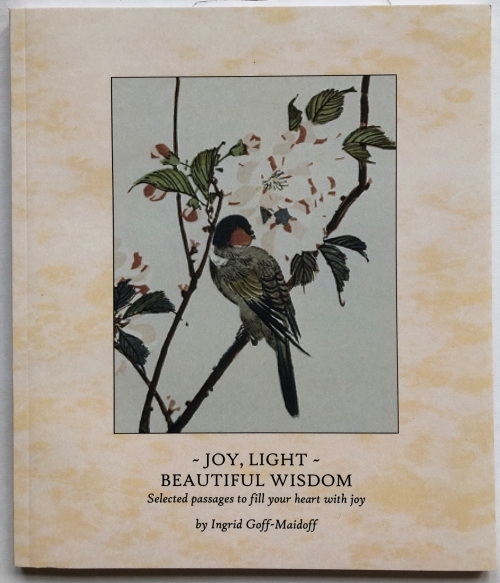 ~Joy, Light, Beautiful Wisdom ~$14. This is a new and revised edition, re-printed at the urging of a physical therapist who wanted ten copies for her clients who loved the one in her waiting room. I'd retired this book after making The Joy Book, but when I looked back at it, I realized it is still a lovely offering. She told me not to change a thing... but I couldn't help but add even more passages of joy, light and beauty. Offering wisdom from throughout time and around the world, this beautiful collection of inspirations encourages an intimate and energetic partnership with Life, a partnership from which the most lasting joy is born. Enjoy these passages as they bring light to your soul, love to your heart, and an outlook on each day that is uplifted and inspired. and of the world-soul with Supreme Love." and makes us aware that we are nothing, but the light is all.